Omigah, I’m back again….Fine Frock’s back ALRIGHT! Oops! Let a lil’ ole’ year slip by without blogging AT ALL. I totally thought I was going to have a lot of spare time on my hands to write when all I was doing was staying home and taking care of a baby! HOW HARD COULD IT BE!??? I’m just going to lounge around in my silken vintage robes whilst my baby falls asleep quickly and peacefully in my arms, leaving me to luxuriate in my ample free time. I shall be inspired to put together looks, and also have the clarity of mind to form sentences about them, despite chronic and soul-crushing sleep deprivation! LOLOLOLOLOLOLOLASDFJKL:…oh, 2018 Erika, you sweet, naive, babyless fool! Annnyways, let’s get into it! Outfits, obscure and outdated pop-culture references, and TANGENTS! So there’s this phenomenon that happens when you thrift a lot, whereby you find one particular type of clothing item that speaks to you, like say, a 70’s polyester shirt with a novelty print, and then suddenly you start seeing similar items every time you go. It’s like that thing where you learn a new word and then you hear it used like four times in the same week. My current item obsesh is pink blouses. This style choice is a bit of a departure from my usual, as I’ve long considered a wardrobe full of dresses the ultimate get-ready hack. You just put on one piece of clothing and you’re fully dressed + looking pulled together. It’s actually the laziest outfit you can put on, but in the age of the yoga pant everyone thinks you’re going to the Kentucky Derby if you put on a dress. WoW YoU’RE So DrESsEd uP! Anyway, I’ve been trying to pinpoint what it is about 70’s and 80’s era blouses that I love so much, and I think it boils down to the fact that they are so dramatic. There are endless combinations of details that serve no functional purpose: pleats, Elizabethan collars, ruffled shoulders, elaborate covered plackets, statement sleeves, pussybows, ornate buttons. Somehow these blouses manage to embody pioneer vibes, the Renaissance, and are also glam?! I don’t understand it either, it’s just true. OG followers of my instagram may recall my preoccupation with Mallory Keaton’s outfits on Family Ties. 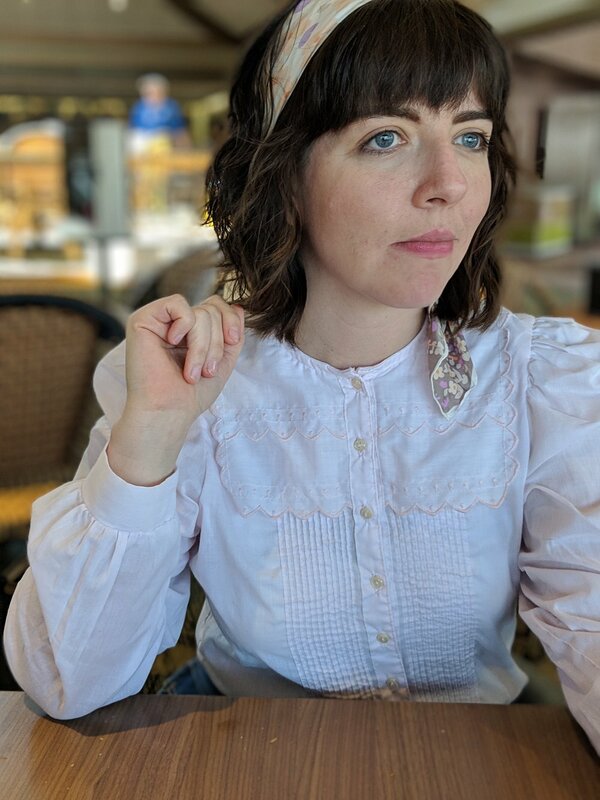 Mallory was no stranger to a blouse, and thankfully someone on the internet was doing the Lord’s work and put together a tumblr that just showcases Mallory’s outfits. Alex P. Keaton: the only acceptable Republican to crush on. I would be remiss if I didn’t also site Molly Ringwald’s outfits in Pretty in Pink and Sixteen Candles, which include a number of frilly tops paired with pearls. She also often adds in a masculine element with over-sized blazers, vests or bowler hats, which I love. See also: everything Jane Fonda wears in 9-5. I mean! That is STATEMENT RUFFLE! Now that you understand the inspo, let’s get into the tops! So I’ve been thrifting a lot for the last ohhh…8 months? All the tops featured in this post are from thrift stores and cost somewhere between 99 cents and $2.98. Can you guys tell I’m eating an animal cracker here? We’re in a zoo cafe. Yes, it’s very busy, but I’m not mad at it! Worn here with a mustard skirt (not vintage) and mustard tights (you can’t see them). THIS BLOUSE! I love this dusty pink lil number so much! She’s got a high neck and a ruffled front and is just the greatest romantic/piratey style top! Here I’m wearing it with an army green button down skirt, but I think it would look cute with basically anything. Finally, we have this pearlescent pink pussybow blouse…yeah. It’s honestly a bit much (and that’s coming from me soooo) and makes me think of the late 90’s which I’m not really into. Also the ties were each about 50 feet long, so I had to wrap them around my neck until it looked like I was being strangled by a ballet slipper. So this one might go right back to the Thrift America from when it came, BUT, I styled it with this 60’s dress from Lion’s Mane that I’ve had forever. So there you have it! I’m back and I’m blousy! Squarespace won’t let me embed this vid, but it’s the Chapelle Show Prince basketball game- Shirts vs. Blouses. If you know, you know. NSFW and also problematic.